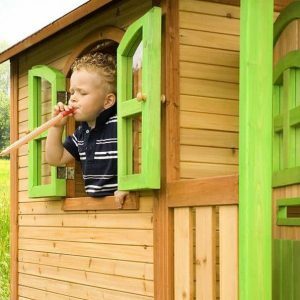 The large 14 x 6 Marc Axi Playhouse is one of the most feature packed and impressive playhouses in this whole line and in many ways it is the Ferrari of children’s playhouses. This is a high tower playhouse and to get up to the awesome decking they will get to scale a child safe ladder which has some nice thick rungs. The decking area is full of possibilities from outdoor afternoon tea to just staring out over the railing. There is a long wavy slide on the side of the playhouse which will be a lot of fun for them and the toys that they throw down it. Inside the playhouse they have a lot of room to play with their toys or any of their friends who come over to visit. Underneath the playhouse is a sandpit which is going to be a lot of fun when the weather is good. This playhouse is made using Asian cedar timber which gives it, its smooth look, but also ensures that it is on strong structure. 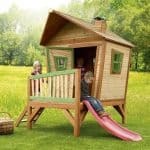 The walls are made with tongue and groove cladding that is 15 mm thick and this along with the chunky planed and smoothed frame, make this a playhouse that can take a lot of punishment from the kids and also last many, many years. 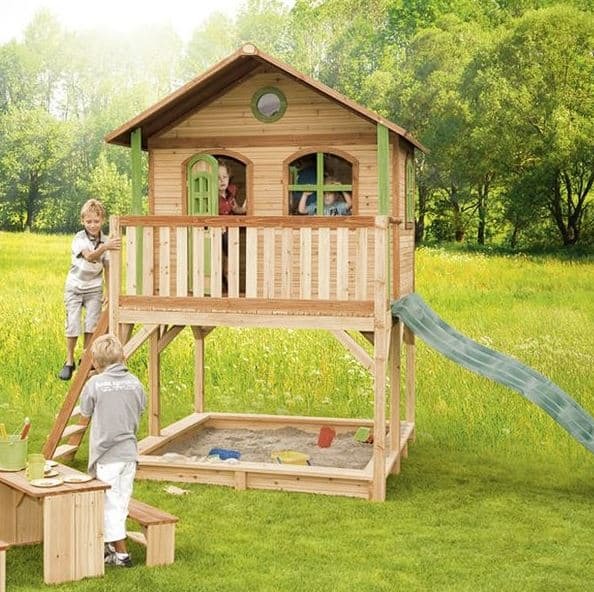 Today we are looking at one of the largest playhouses in this entire line, the 14 x 6 Marc Axi Playhouse. This high tower playhouse stands with pride and it really does have a very striking and impressive look to it. Both boys and girls are going to have a great time with this. This is a rather large structure so you will need a fair bit of space to install it. The width is an incredible 14 feet 3 inches and the depth is, 6 feet 6 inches. From the floor to the very top of the apex roof is 9 feet 6 inches so as you can see this is quite a high playhouse which kids are really going to love. As well as the actual playhouse there are four other fun features that this one has. To start with as this is a high tower playhouse, they have actually put a sandpit underneath it. This is really cool and most of the time kids love it when there is a big open space, so they will really go crazy when they see there is a sandpit as well. One side of the playhouse has a ladder, this is quite a high ladder and as we all know kids love to climb so they will enjoy this. Once up the ladder there is the decking area which will make them feel like they are a mile up in the sky, due to the safety railing they are always safe up here. Lastly we have the slide, this long wavy slide will let them get down from the playhouse with some style and it is also a lot of fun. This line of playhouses has one of the best apex roofs we have seen. Instead of using sand felt or mineral felt, Axi go all out and use actual timber to make the roof and it really does look amazing. It is made so that it sticks out a little over the decking, giving the kids a veranda which is a very nice touch. 15 mm thick, tongue and groove shiplap cladding is what makes up those silky smooth walls you can see in the pictures. This is actually a few mm thicker than what most other playhouses offer so it is very impressively thick as well as being attractive. Because of the Asian cider wood that this is made from the walls are very strong and can take what mother nature and the kids throw at them. No matter if you have a couple of boys who love to turn every room they are in into some kind of battle arena or if you have a couple of girls who love to dance, the 28 mm thick, chunky frame that keeps this playhouse together ensures it can take it. We really love the frame that they use in this line of playhouses and we actually wish a few more manufacturers were willing to use a frame this thick. Strong flooring ensures that more than a few kids and a whole load of toys can be inside here. We are actually very impressed with the quality of the flooring and have no concerns over it at all. One other thing we love about the floor is how it looks. In the decking you can see just how well the floor goes with the rest of the playhouse. Wood treatment should be applied soon after installation. We always say that within the first week is when you should treat the playhouse so you start the protection from rot, right from the get go. 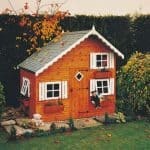 To be fair not much upkeep is required of this playhouse, a fresh coating once a year is all that you really need to do. 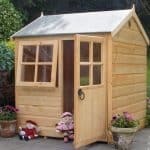 You are protected against rot for five years due to the generous guarantee you get with this playhouse. There is a very charming door on this playhouse that is high and wide enough that when they try to drag a giant stuffed teddy through the door that they will be able to do so. The design of the door is perfect for a child’s playhouse. It has a large window that has a thick frame on it and there is this fantastic little letterbox so they can receive mail. In total there are five windows on the 14 x 6 Marc Axi Playhouse, all of which are made with shatterproof acrylic. On the front there is this smaller sized, circle window that is placed high, we really love the way this looks and think that it was a great design choice. Also on the front is a fixed window to go with the one that is on the door. There is a window on each side of the playhouse and these ones can actually be opened. They can be securely closed thanks to these magnets which are on them, we really like this and feel the kids will be able to open and close the windows easily. No lock comes with this playhouse, but that is what we have come to expect as a lock on a playhouse is usually more of a hassle than anything else. We find that with the door closed and those windows also firmly shut, that you do have a secure playhouse on your hands when the kids are not playing inside. Even though there is a number of windows, we still feel that this is one of the more private playhouses out there as the placement of the windows, their design and in the case of the ones in the front, the railing can make it tricky for people to look inside. If you want to give the playhouse a little bit more colour then we suggest looking for a wood treatment that is coloured. If you wanted to add a little plant life to the playhouse then there is a plant and flower box that they have which can be used on the decking or under a window, but this will cost you an extra £34.95. Axi have a few different extras with this playhouse. If they will be having some kind of tablet device in here to either watch Netflix or just listen to some music, then you may be interested in the solar kit – this costs £74.95 and it will allow you via a solar panel to have a little bit of power, enough to charge a device, in the playhouse. 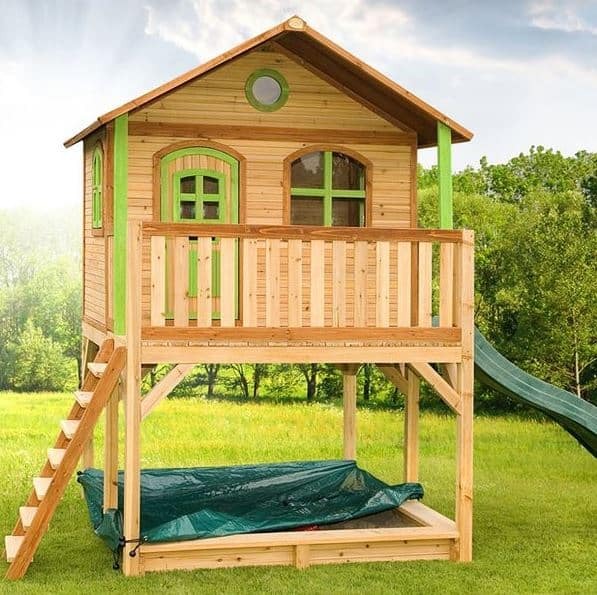 This is a large playhouse with a sandpit so we do not see the wind being able to move it, but they do have an anchor kit for £54.99, but like we said we do not think it is really necessary. They have a chalkboard which can go on the wall and this will cost £29.95. This may sound pricey, but this chalkboard is designed to go with the style of the rest of the playhouse. 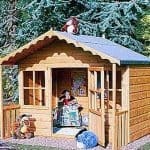 This is a high quality line of playhouses and the large size of this one only makes it even clearer just how impressive it is. We can see your children being able to make use of this for a very long time. Axi playhouses are made to last and as long as you do treat the timber once a year the wood will stay looking smooth. This is the largest playhouse from Axi and it will need a decent sized garden to fit in. The actual playhouse is a very good size, but you also have the decking area and the sandpit underneath. Any playhouse or even a shed for that matter of this size is going to take quite a while to build, 5-7 hours would be a good time, but do not rush, follow the instructions and make sure you have talked a friend into helping you out. 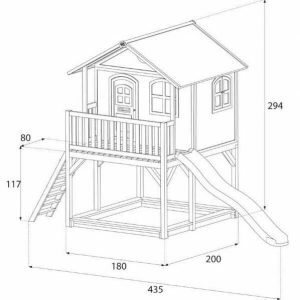 We know that at over a thousand pounds this is a very expensive playhouse, but as we said at the start this is the Ferrari of playhouses and for that vast amount of money, you are getting a playhouse that is made with the highest quality. 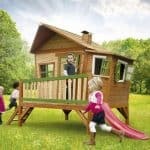 Final Thoughts: At, £1059.95, the 14 x 6 Marc Axi Playhouse is one of the most expensive playhouses we have seen, but for that money you are getting pure quality all through the playhouse. Not only is it made with the finest materials that will last many years, but it is also going to be a lot of fun for the kids with the ladders, sandpit, slide and of course the shenanigans they can get up to inside the playhouse as well. 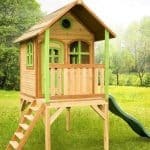 If you can get over the price or are even willing to save up an extra month or two then this is a playhouse that you will be very happy with and the kids will just adore.